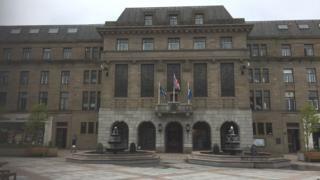 The SNP will form a new administration on Dundee City Council after agreeing to work with Independent councillor Ian Borthwick. Mr Borthwick, who has been a councillor in the city since 1963, will become Dundee's Lord Provost. Dundee SNP group leader John Alexander met a number of councillors this week in an attempt to find "common ground". The SNP won 14 seats in Dundee in last week's council elections, one short of an overall majority. Labour won nine seats, with the Conservatives and Liberal Democrats winning three and two seats respectively. Mr Alexander said he will meet Dundee's two Liberal Democrat councillors and Labour counterpart Kevin Keenan to "ensure cross-party support" for the administration. He said: "I'm delighted that our group and Councillor Borthwick have been able to formally agree to work together in the best interests of the city. "It's important that our new administration continues to engage with all opposition members throughout our term. "In that vein, I will be seeking to build consensus on an ongoing basis and I intend on setting up a regular meeting with the respective leaders to ensure that there is the opportunity for open, honest and frank discussion like never before." Mr Borthwick said: "My aim throughout our discussions has been to do what is in the best interests of the city and its people. "I'm pleased that my discussions with John Alexander have been positive and focussed on our shared ambitions for Dundee."